Is the idea of being able to work at home appealing to you? I know that it is for me! For many people, working from home is a dream come true. It gives a person back a relative amount of freedom to plan their day and feel more relaxed. With no commute time, you may free up hours of time each day for other things. However, finding success when working at home can be a challenge for many people. You may be tempted to sleep longer in the morning. You might take time from your work day to run errands. Or, you might find a favorite TV program that distracts you. How can you make a success of working at home? Read on to find out how you can enjoy your dream job without ever leaving the comfort of your home. First and foremost, you need a good routine for your workday. This involves starting and finishing work at a set time every day. It is also important to take a set lunch break to relax and ‘recharge your batteries.’ However, you do not need to be too strict. Because working from home gives you more flexibility, you can take a few more breaks during the day than would be possible if you worked in an office. A good routine with the proper amount of breaks while working at home will make your day much more enjoyable and productive. Dressing for work doesn’t mean putting on a suit, a shirt, and tie or a suit dress if you are a woman. It also doesn’t mean working in your pajamas and dressing gown. So, in the morning you should shower and get dressed as if you were going to the office. In fact, dressing for work actually affects the way that you deal and speak with people when you call them. Even though they can’t see you, if you are dressed for work you will assert yourself more professionally. Not sure this is true? Give it a try for a week and notice the difference in how you carry yourself throughout the day. What we wear truly makes a difference! To make a success of working at home, it is important that you have a proper work environment. 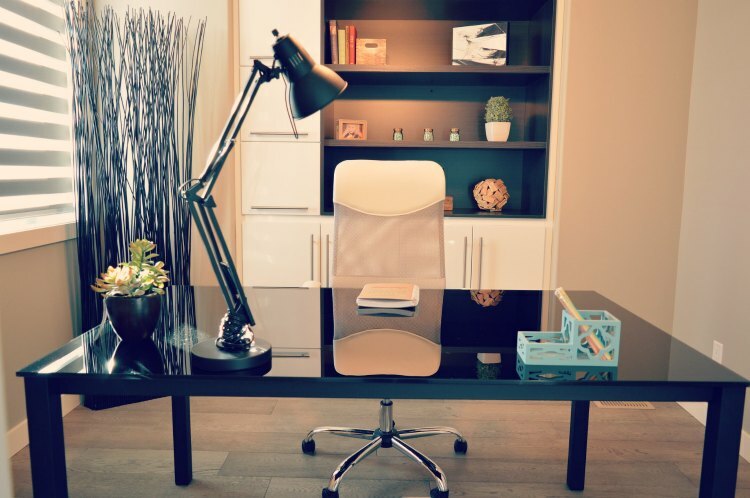 If possible, you should have an office space at home that is reserved only for your work. Some people have made space in a converted garage, a spare room, or dedicated a corner of a quiet room for their workspace. This can help you ‘leave’ work when you finish your day. When a dedicated workspace is not available in your home, then consider how you can transition to other uses. I do the majority of my work at the table in our open space. However, I need to have ways to contain items needed so they can all be cleared off for meals. Distractions are everywhere regardless of where you work. However, at home, you get distractions in the form of things you need or want to do for your overall life. It is very easy to start doing simple jobs around the home when you should be working. Even something as simple as answering the doorbell can make you lose your focus. If you have to run errands, try to do these before or after your workday or during your lunch break. However, it is important to be balanced with these duties and not go to the other extreme and become so inflexible that the rest of your family wished that you worked in an office! One of the reasons that working at home has become so popular is because of advancements in technology. It is now easier and cheaper to connect with your boss and colleagues remotely. In fact, this has helped many people expand their business because they can now have clients all over the world. For example, you can take advantage of cloud computing by keeping your work documents online. This makes it much easier to share documents and collaborate with others on them. Skype and Google+ Hangouts have made video conferencing available for everyone. These also allow screen sharing and whiteboards so that you can brainstorm new ideas. This helps you stay in touch with your co-workers and be more productive. However, don’t forget, that if you work as part of a team, it is still good to have a monthly in-person meeting because this can be more productive than doing everything remotely. 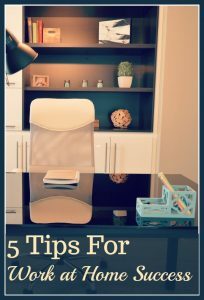 Using these 5 simple tips when it comes to working at home can set you up for the success you desire. Once these easy things are achieved you can begin to tackle the bigger obstacles as well. Is working from home something you dream of doing? What are some ways you separate your work and life when working from home? Thinking this is a path you want to take, but are not sure where to start? Affiliate links are present which may result in my earning a commission if you purchase through them. I’ve ordered my copy and am starting to dig in to find others ways to diversify my income. The Rockin’ Virtual Assistants eCourse was on my list to purchase later this year. I just saved $200 on it! After Monday night, June 12th, the sale ends and you’d have to buy all of these products individually. I’d hate for you to miss out, so CLICK HERE to learn more or buy the bundle. It’s even backed by a 100% happiness guarantee, so you can make sure it’s right for you. These are great tips. I need to dress for work more often. I find myself sitting at the computer after lunch in my pajamas some days! I love being able to work from home! Thank you for the tips, I really need to work on getting dressed for work - I totally fail at this one! Dressing for work is SO important (as well as having a routine). I know the days I actually get up, shower, and put on clothes (vs yoga pants, leggings or pjs), I feel more accomplished! Weird, but that little trick really works! I am a routine person! If there is no routine, my mind tends to go crazy. One thing I do need to work on is the dressing nice. Its so easy to put on running shorts and a t-shirt for the day. It is interesting how different you do feel though when you dress nicely and make your hair look half nice.